Educational materials and workbooks focuses on transferring skills and knowledge of geography, history and culture using a creative self-help learning approach. The first set of workbooks are designed to exclusively focus on Africa and the Caribbean. There are also booklets which focus on personalities as role models, highlighting their achievements and contributions. A painting book which takes children through Africa by giving them the opportunity to have fun and learn about the continent by painting flags in African colours. A painting book which takes children through the Caribbean by giving them the opportunity to have fun and learn about the continent by painting flags in Caribbean colours. A book of maps whish takes children on a journey of across Africa. This workbook identifies major landmarks within each country and allows the children to add colours and enjoy painting. A book of maps which takes children on a journey across the Caribbean. This workbook identifies major landmarks within each country and allows the children to add colours and enjoy painting. This workbook is for older children. 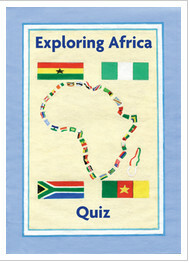 A workbook which allows older children to learn more about Africa through the selection of multiple choice options and answering questions on flags.